Asim Chaudhuri had left India for the United States in 1965 for post-graduate studies in Engineering and Management. He spent his entire professional career working at Caterpillar Inc., the world’s largest manufacture of earthmoving equipment based in Peoria, Illinois, as a manager in the Research, Engineering, Manufacturing, and quality departments. He is a six sigma Black Belt. 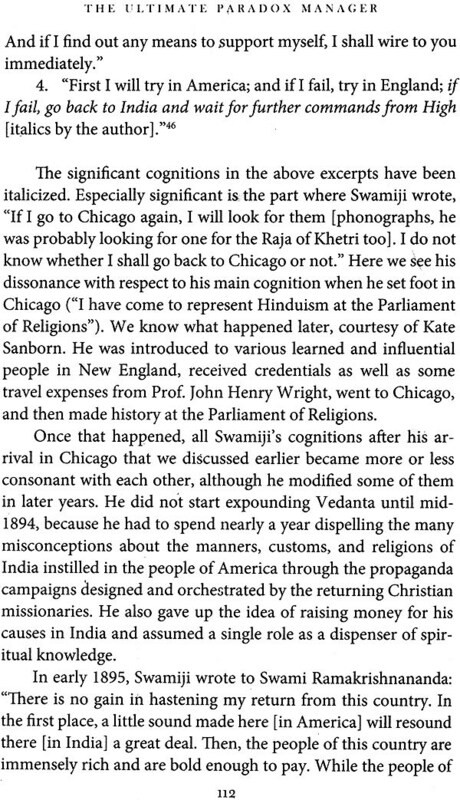 His Personal research following Vivekananda’s footprints in the United States culminated in three seminal books: Swami Vivekananda in Chicago: New findings, Swami Vivekananda in a Chicago: New Findings, Swami Vivekananda in America: New Findings and Swami Vivekananda in England and continental Europe: New Findings. He also authored Vivekananda: A Born leader. The Present book is the author’s fifth important work on Swami Vivekananda. He is the recipient of the prestigious Vivekanda Award 2009, given by the Ramakrishna Mission institute of Culture, Kolkata, India. He now lives in California. US. Swami Vivekananda's multifaceted personality, his wanderings, his musings, his teachings, and his eventful life have provided enough material to keep legions of writers busy for years. This will probably continue for decades-no, centuries-as succeeding generations re-evaluate his contributions to humanity, reinterpret his message, and explore his character and ideas. Fortunately, I have been a member of that pack of writers, and I have followed his footsteps through the United States, England, and Continental Europe. 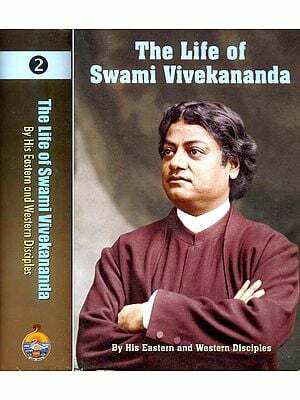 This endeavor has resulted in three books: Swami Vivekananda in Chicago-New Findings; Swami Vivekananda in America-New Findings; and Swami Vivekananda in England and Continental Europe-New Findings. All three have been published by Advaita Ashrama: in 2000, 2005, and 2015, respectively. There has been one detour, however, which I took between the second and third book when I could not physically travel. It was a conceptual detour, and I took it to portray Swami Vivekananda as a leader and a manager (or leader-manager). Thus the book Vivekananda-A Born Leader (published by Advaita Ashrama in 2011) was born, to use a pun. Unlike the other three, this book dealt with an aspect of Vivekananda's character that had never been studied on its own, especially in the light of modern management and leadership theories. There was no pressure to reach airports on time, or to travel by car or train to places he had visited, or to take photographs. All I had to do was sit at my desk, study my sources, think, and write. The present book is a spin-off from that book, which devoted a chapter to showing how Swamiji succeeded in managing paradoxes. It behoves great leaders to manage paradoxes, and he was a great leader. Among the numerous paradoxes he had to manage throughout his life, I mentioned only a handful in that chapter. A sequel was needed to develop the topic in more detail. This is that book. 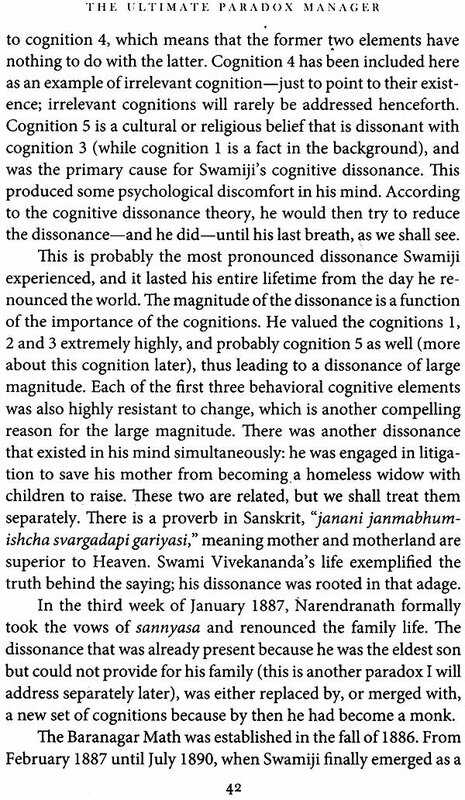 In examining and analyzing the various paradoxes in Swamiji's life and thought, I have sought help from Leon Festinger's theory of cognitive dissonance. Cognitive dissonance means the ability (of a person) to hold simultaneously at least two logically, or psychologically, conflicting opinions or beliefs. In order to prepare readers who are not familiar with this powerful concept in social psychology, which became prominent in the 1950s and 1960s, I have presented the fundamentals of the theory first, together with definitions of terms and examples. I hope this introduction will help readers to understand the nature and complexity of the paradoxes and how Swamiji managed them. Readers who are intimately familiar with his life know about the apparent contradictions and inconsistencies, but this approach uses the theory of cognitive dissonance to explain them from a well-established psychological perspective. Readers are requested to familiarize themselves with the terms used in the theory, because I refer to these repeatedly throughout the book. However, some words of caution are in order here. The process is rather addictive, and the reader may be tempted to analyze his own dissonances (everybody has them), or somebody else's, with the help of the theory. There is no harm in that, and there is enough material in the book for him to be able to do so. 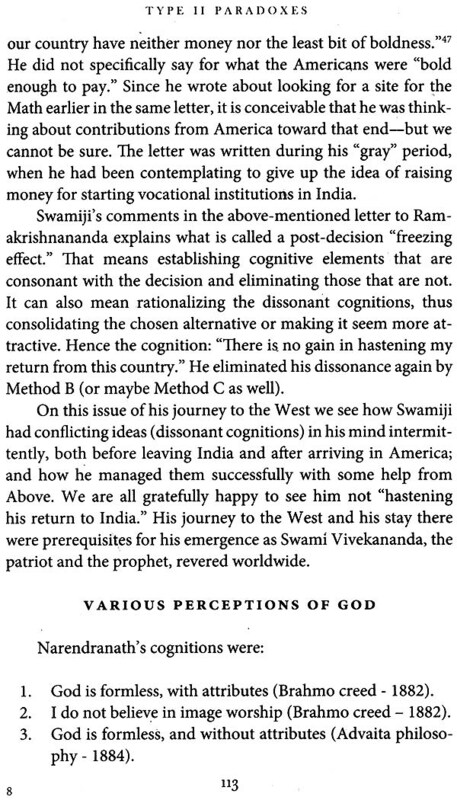 The exercise may also help him understand more clearly how Swamiji dealt with his own cognitive dissonances. I owe a large debt of gratitude to Swami Vedatitananda, Swami Shuddhidananda, Gopal Stavig, and William Page for their suggestions that enriched the contents of the book and improved its overall appearance. My heartfelt thanks go to William Page for editing the book. 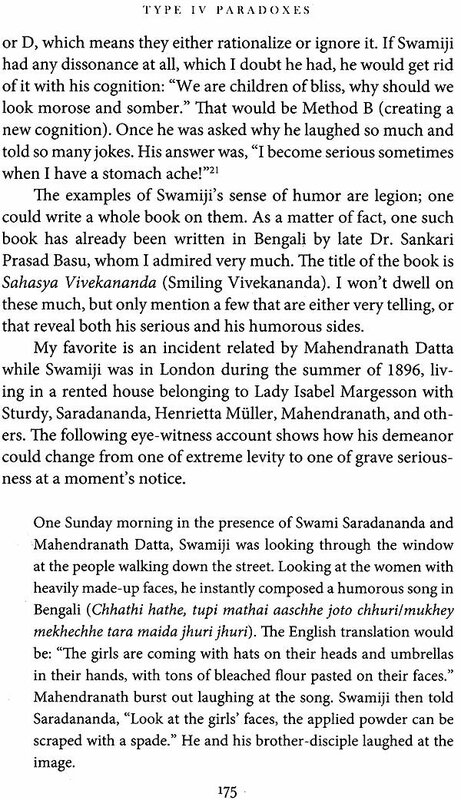 Dr. Mrityunjay Athreya, once again, has indebted me immensely by penning the Foreword, and I thank him for that. I am also grateful to Swami Tattwavidananda, the President of Advaita Ashrama, for publishing the book. I don't claim to be a psychologist or social scientist; I am an engineer by academic training who puts two and two together and comes up with four (most of the time). That will be apparent to the readers from my style of presentation. While I was thinking about how best to approach the subject of paradox management, I came across Festinger's book, A Theory of Cognitive Dissonance. After reading it, I realized that I could apply the theory to the paradoxes in Swamiji's life-to explain them, to frame the cognitions that led to them, and finally to relate how he resolved them. While Festinger's work helped me do that, Abraham Maslow's work helped me to explain at the end, in the Epilogue, why Swamiji was able to manage the paradoxes the way he did to emerge as the "ultimate paradox manager". It is always a pleasure to write the Foreword to a good book. I consider it to be my duty to do so, when requested, except in exceptional cases, for valid reasons. Writing this Foreword is an added pleasure for the following three factors. First, the writer of the book, Sri Asim Chaudhuri, is a proven author. This is his fifth book on Swami Vivekananda. I have pleasant memories of contributing the Foreword to his book Vivekananda-A Born Leader in 2011. 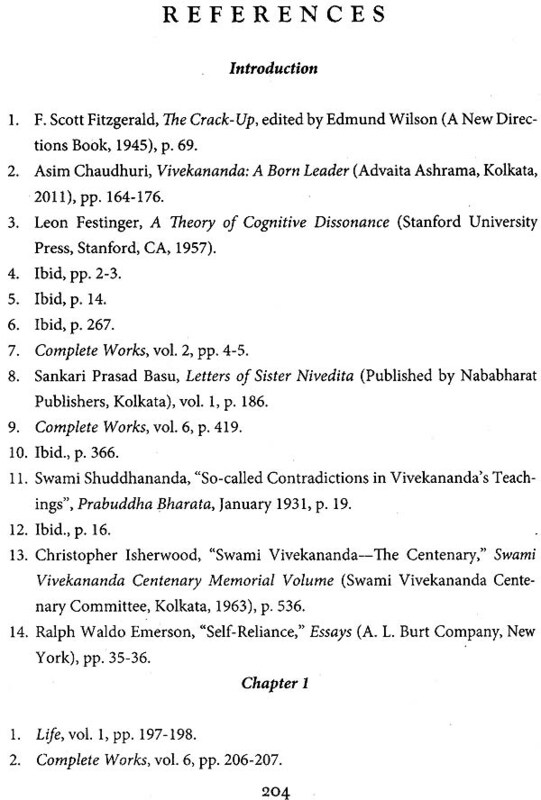 Second, this book is also on Swamiji. There can be few better deeds than supporting the dissemination of further research and insights on Swamiji's legendary life and work. Third, this request has also come through the Ramakrishna Mission, to which I owe a deep debt. This institution has been a formative influence on my spiritual development. In my first stint in Kolkata (1961-64), between my graduation from Chennai in 1960 and proceeding to the V.S. in August 1964 for my doctoral studies, I listened to the powerful lectures on the Bhagavad Gita and the Upanishads by the eloquent guru, Swami Ranganathananda, at the Ramakrishna Mission Institute of Culture, Gol Park. The lectures, appropriately, were held at the beautiful, huge, Vivekananda Auditorium. In this book, the author focuses on paradoxes in Swamiji's life and how he resolved them. He draws upon the concepts of an American social psychologist Leon Festinger. This approach of the author is appropriate to reach the modern educated elite, more comfortable with logic and argumentation. Rooted in the Vedanta tradition, of which he was a modern exponent, Swamiji may have looked at these situations as apparent paradoxes, and not real contradictions. "Truth is one, but the wise speak of it in many ways", says the Rig Veda; and the person who, through meditation, has become one with the cosmos, sees unity in all; he is aware that "one who sees differences, perishes" (Katha Upanishad). Chaudhuri's explanation of Swamiji's possible resolution of apparent paradoxes in his life, through the prism of Festinger's theory of "cognitive dissonance", is creative. It can help reach a wider section of the current Indian and global readers, more familiar and comfortable with rationalistic approaches. At the behavioural level, the theory is valid for the vast majority of human beings. Having made a particular choice, one tends to accept and amplify inputs justifying that choice, or reject or condense inputs questioning that choice. Nevertheless, one keeps learning to make better and better choices in future. We mortals experience cognitive dissonance everyday in our lives, and we manage it in our own unique ways without paying much attention to the process we adopt while doing it. Chaudhuri has taken the mystery out of it and introduced us to the formal process of dissonance resolution that we use rather unwittingly. 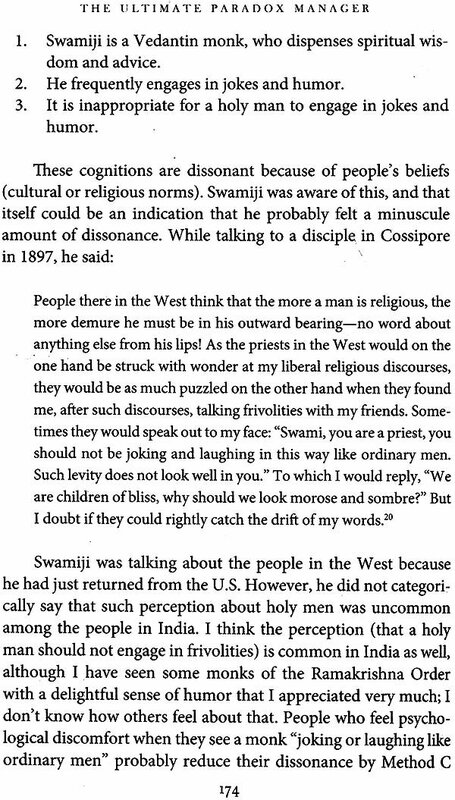 Swamiji, being a spiritual giant that he was, might have had special ways to resolve his dissonances, which Chaudhuri has frequently alluded to, but Chaudhuri uses the formal process that is applicable to all of us to explain how Swamiji might have done that. This makes it easy for us to understand, from our own perspectives, how Swamiji was able to eliminate, reduce, or ignore the dissonances he experienced. 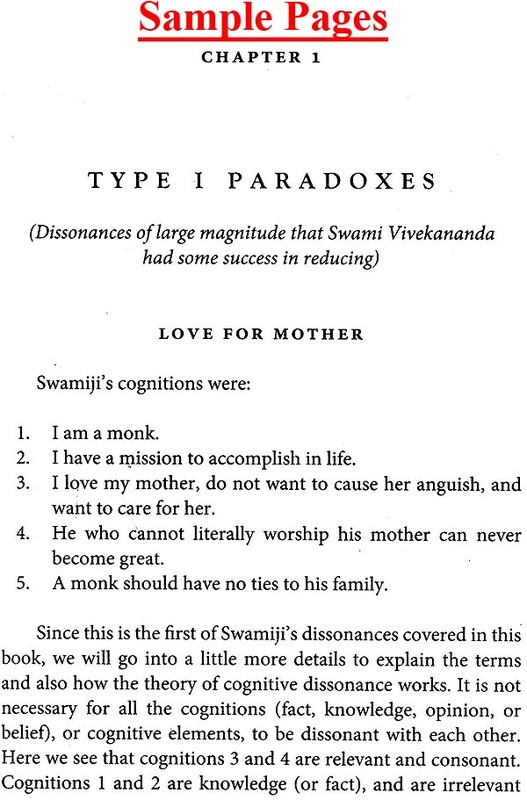 Chaudhuri divides the paradoxes in Swamiji's life into five types: large, medium, small, apparent, and unresolved. There is a chapter on each type. Under each type, a few examples are cited, where Swamiji felt dissonance, leading to a variety of feelings like guilt, sadness, weakness, hopelessness, anger, etc. As a technical professional, the author presents a systematic analysis of the different cognitions of Swamiji for each example-the consistency between some of them, and inconsistency between some others. 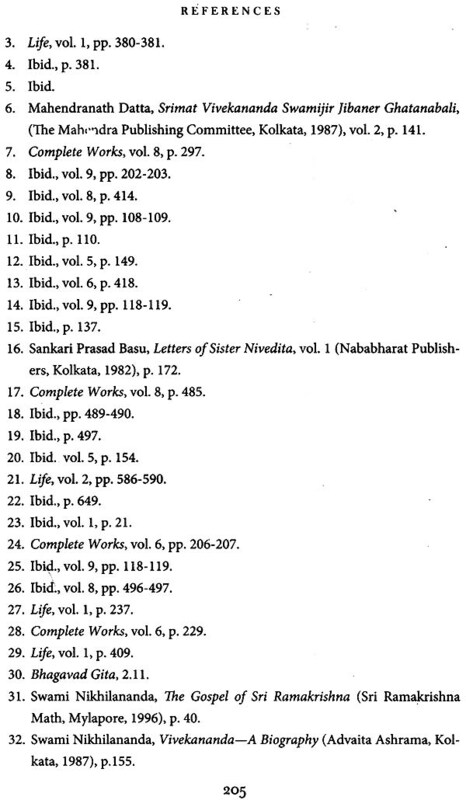 He also brings out, by extensive research into Swamiji's speeches, statements, letters, conversations, actions, etc. 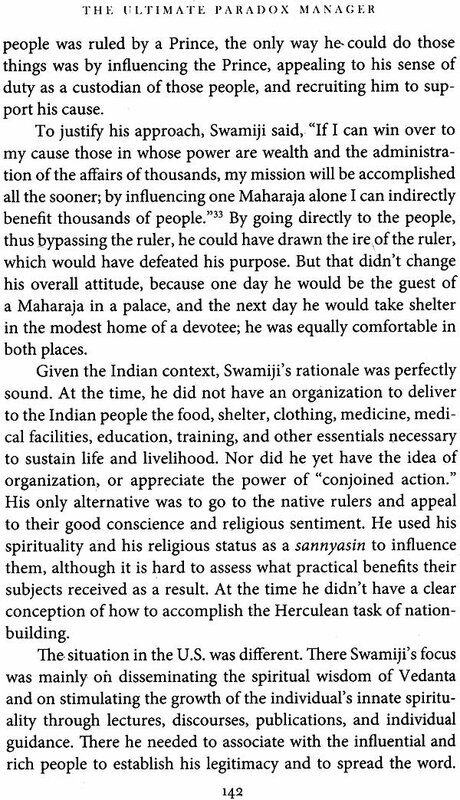 how and to what extent Swamiji resolved them, lived with them, ignored them, etc. The analysis provides many insights. It may also trigger additional insights in the reader, depending on her/his background, especially in the spiritual/philosophical aspects. Similar to the book Vivekananda-A Born Leader, this one also deals with some aspects of Swamiji's nature that has not been addressed before. Most of us are aware of the apparent in consistencies in Swamiji's life that appear as paradoxes, but Chaudhuri has listed the major ones in this book and analyzed those to show how Swamiji managed them. By doing so, he also brought to light Swamiji's transcendent nature that had enabled him to resolve some major dissonances. After the five chapters on the five types of paradoxes, Chaudhuri draws upon another Western author, the psychologist Abraham Maslow, and his "Hierarchy of Needs", which is very useful for explaining motivations of lay humans. In the case of monks like Swamiji, the author, quite rightly, feels the need to add another level at the top of Maslow's hierarchy: Self- transcendence, which is a spiritual need. This goes above Self-actualisation, a personal growth and fulfilment need, which was where Maslow stopped. In addition to the insights brought out by Chaudhuri using the above concepts from psychology and social psychology, there are some other useful perspectives from which also we may look at Swamiji's life. First, in his intense critical examination of his own life, Swamiji was a forerunner of Mahatma Gandhi, who, Similarly, was totally transparent in revealing his life as his message. Second, the Ramakrishna Mission was the first major Indian spiritual organizational response to the British and Western impact on India in the nineteenth century. Sri Ramakrishna himself, as the Master, was totally absorbed in religious, spiritual and mystical experiences. Swamiji was the main link between the Master and the world. Such a role was bound to have its dualities, pulls and pressures. Third, Swamiji was the founder and first institution builder of the Ramakrishna Mission. Building an institution needs human, financial and other resources. 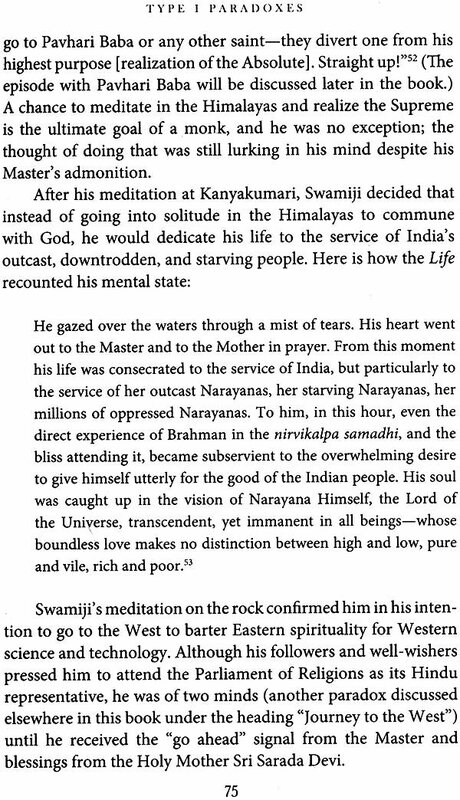 Denying himself the easier route of personal salvation, Swamiji engaged himself with India and the world for a global spiritual awakening, and thus made a priceless, historic contribution. Fourth, more the life is energetic and active on the macro social scene, as that of Swamiji, more the moral dilemmas (dharma sankats). Swamiji was fully aware of the Vedantic guidance that such moral dilemmas should be resolved by adopting the higher path (higher dharma) in each case. So he had to choose the path of a monk, despite his deep love for his mother and concern for his family. Fifth, in moments of despair and anger at God, Swamiji was also aware that dharma, ethics, and Truth (sat yam) will always win in the end. 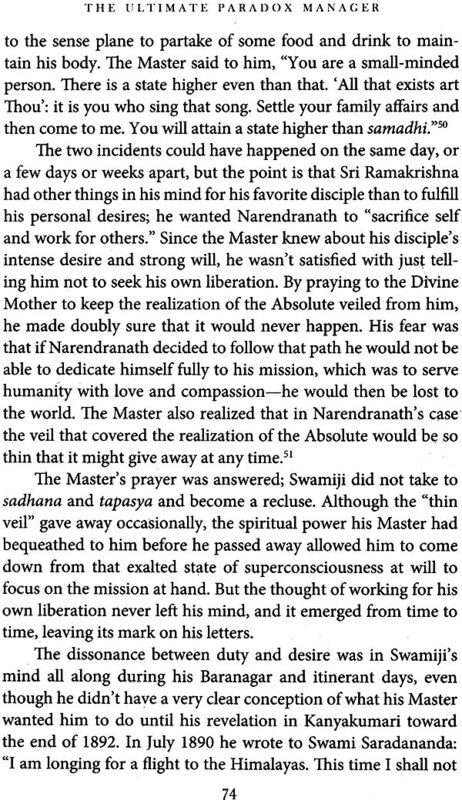 Thus, Swamiji became a role model of the Mission's teaching: �For one's own liberation, and for the good of the world" (atmano mokshartham jagat hitaya ca). Sri Asim Chaudhuri has written this book with his sustained great reverence for Swamiji. It will help a newer and wider, modern, Indian and Western educated audience to better understand and respect Swamiji, and to learn from his management of paradoxes. Swamiji's relevance continues to be timeless, spanning centuries. According to Webster's New World Dictionary, a paradox is a statement that seems contradictory, unbelievable, or absurd, but may actually be true in fact. The word paradox first entered the English language in the 16th century, when it simply meant an eccentric opinion; but in contemporary English, the word refers to a self-contradiction, or a situation that simply defies logic. As an example, suppose someone says "I am a compulsive liar." Would you believe him? The statement itself is self-contradictory, because if it is true, then it is false (because he has told the truth). Conversely, if the statement is false, then it is true (because he is lying). Sounds confusing? Paradoxes usually do, until you dissect and analyze them for their hidden meaning. Paradoxical statements are often used in literature to make a point. A classic example can be cited from George Orwell's satirical novel Animal Farm, where we read: "All animals are equal, but some are more equal than others." The statement does not make logical sense, because the second clause contradicts the first. But the political point Orwell was trying to make here was that the government's claim that everyone is equal is false. Everyone is not treated equally; the government's concept of equality is open to interpretation. Another example is William Wordsworth's well-known saying: "Child is the father of the man." The apparently absurd expression makes sense when we look into its actual meaning: a man's childhood will shape the life he will later experience as an adult. Still another example is Charles Dickens' opening statement in The Tale of Two Cities: "It was the best of times and it was the worst of times." Both statements are true, depending on your perspective. Life is full of contradictions and paradoxes. Many of the choices we have to make are not an either/or choices. It would be nice if they were. Then we could just choose one or the other and go on with our lives. But life is a balancing act between competing demands that generate tension. People who can manage those demands without losing their cool usually turn out to be successful in life. F. Scott Fitzgerald (1896-1940), the famous American novelist and the author of The Great Gatsby, once said, "The test of a first-rate intelligence is the ability to hold two opposed ideas in mind at the same time and still retain the ability to function."! If we study the biographies of great people, we will see paradoxes permeating their thoughts, teachings, writings, and even their day-to-day lives. 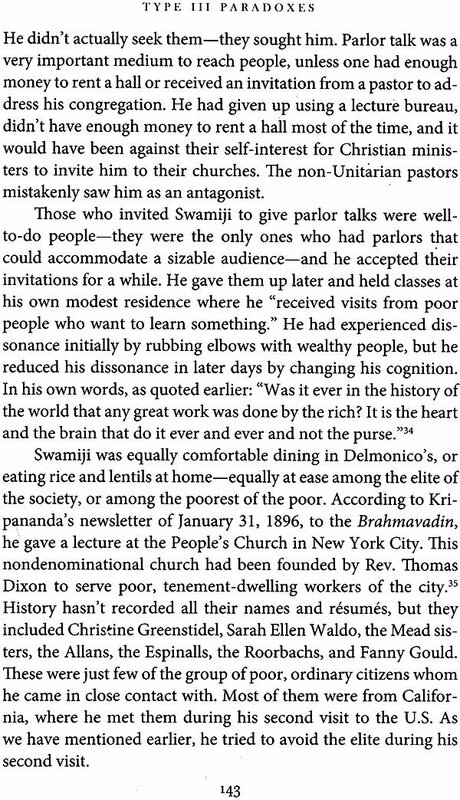 Swami Vivekananda was such a person-and so was his Master Sri Ramakrishna. Paradoxical statements In literature and paradoxical situations in life both involve contradictions. But the former are used to amuse readers and challenge them to find hidden meanings, whereas people have to deal with the latter in real life. We were all happy with the words ambiguity and paradox, until another expression arose in the mid 20th century: cognitive dissonance. The term was coined by the American social psychologist Leon Festinger (1919-1989) in the late 1950s; it is one 'Of the most extensively studied theories in social psychology.' Definitions and ideas on this subject have been used here extensively from his seminal book, A Theory of Cognitive Dissonance. In talking about paradoxes in life, we have mentioned contradiction and inconsistency. Festinger replaces the word inconsistency with dissonance, which he thinks "has less of a logical connotation"; he also replaces the word consistency with consonance, which he thinks is a more neutral term. In Festinger's book, the term cognition means "any knowledge; opinion, or belief about the environment, about oneself, or about one's behavior.?" These are also called elements of cognition. Cognitive dissonance is the mental stress or discomfort felt by an individual who holds at least two opinions or beliefs at the same time that are either contradictory to each other, or logically or psychologically inconsistent. It also occurs when an individual is confronted by a state of affairs that conflicts with his beliefs, ideas, or values. In other words; when one's cognitions, or elements thereof, are inconsistent, or dissonant, it leads to cognitive dissonance; it is what the individual feels due to his paradoxical beliefs. Smoking can be hazardous to one's health (belief, knowledge, element, or cognition). It is a paradox for an other wise health-conscious individual to smoke. That he is a health-nut, and that he smokes are facts. Those facts conflict with the prevalent belief, or knowledge, that smoking is not good for one's health. In other words, cognitions 1 and 2 are dissonant because of cognition 3.